Since I have dentures, why do I need to go to the dentist? In his column with The Daily Courier, Dr. Rick Farnsworth, D.D.S. fields a very interesting question from a reader: “[S]ince I have dentures, why do I need to go to the dentist?” This question is very prevalent, since more than 10% of the American population (i.e., more than 36 million Americans) are edentulous, which means they do not have any teeth in their mouth. From that group of people, 90% of those wear dentures. With this article, Dr. Farnsworth attempts to dispel the belief that because a person has dentures they no longer need to visit a dentist. The reality is that just like non-edentulous people, people with dentures receive very important benefits from annual dentist visits. The saying that a building is only as good as its foundation is very applicable to people with dentures. 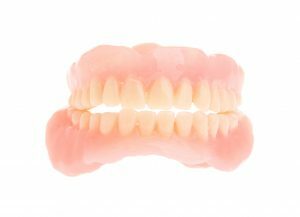 Conventional dentures are primarily supported by a person’s gums. The foundation for the gums is the bones underneath. Thus, maintaining healthy gums and having overall good oral health will help keep the foundational bone levels healthy. Having strong bones and gums will help keep the dentures secure and will prevent sore spots from occurring. The primary way to keep your oral foundation strong is by having an annual visit with your dentist. During the visit, your dentist will assess any changes in your bone level, and check the fit and stability of the dentures. Dentures will also get a routine adjustment to improve its fit and comfort, and prevent sore spots from occurring. Keep in mind that a poor fitting denture cause your gum and bone tissues to shrink much faster. One of the most important parts of the annual visit is the oral cancer exam. Since a majority of patients that wear dentures or partial dentures are older in age, this translates to a higher risk for oral cancer and disease, such as Periodontal disease. The dentist will exam your mouth visually, and can use technology to see areas of concern that may not be visible to the naked eye. Your dentist can also provide you important insight on other tooth replacement options, like dental implants. With advances in dental technology today and if you haven’t been to a dentist recently, you probably do not know that your dentures can be fixed securely in your mouth with permanent implants. Get rid of your slimy and gooey denture adhesive! Get rid of your dentures and replace them with permanent teeth! Yes in some cases, it is possible…ask your dentist, like Bliss Dental Arts Dr. Danny Truong.